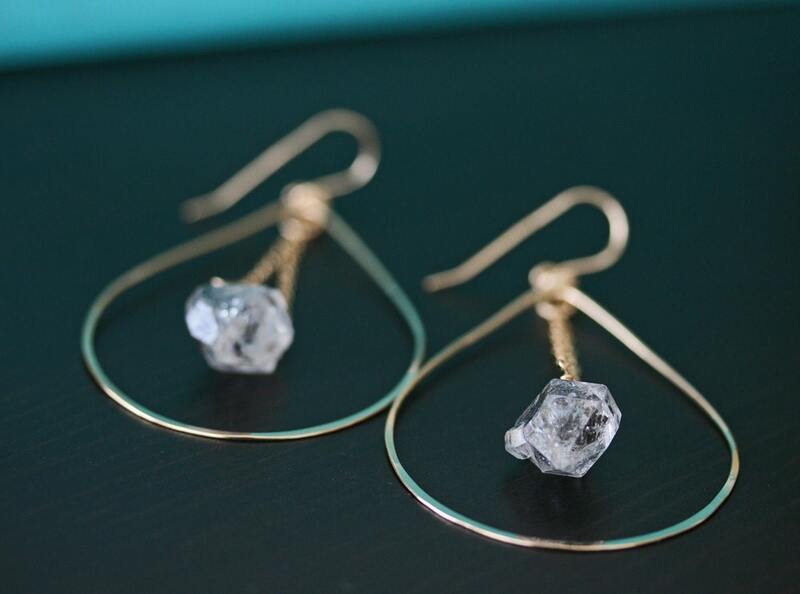 Herkimer Diamond Hoop Earrings. 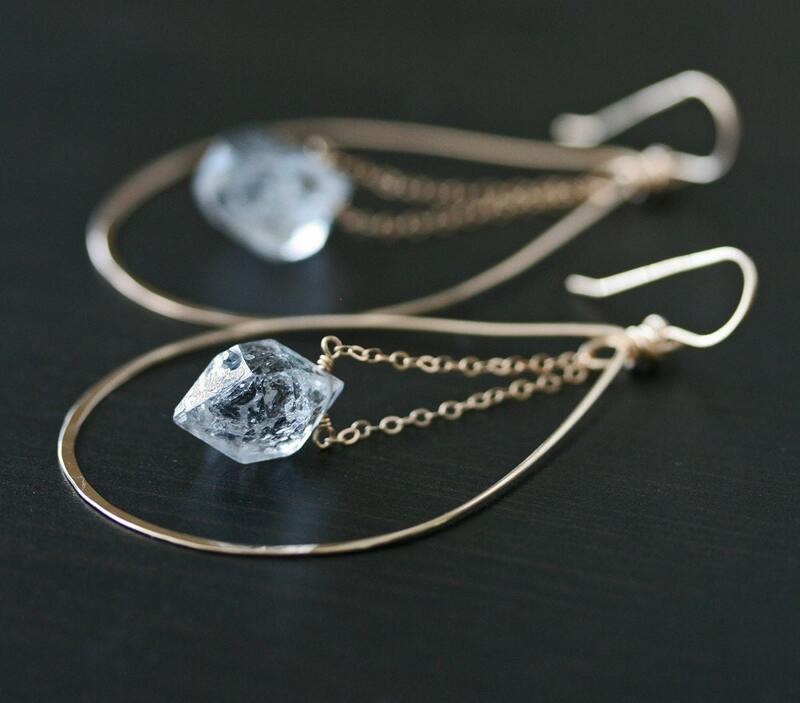 Herkimer Diamonds received their unique moniker from their brilliant diamond like shine and sparkle. These big, beautiful gems are natural/ raw double- terminated quartz crystals with inclusions of another mineral showing black inside the quartz. They are quite lovely and interesting to look at but even better sparkling on your ears. 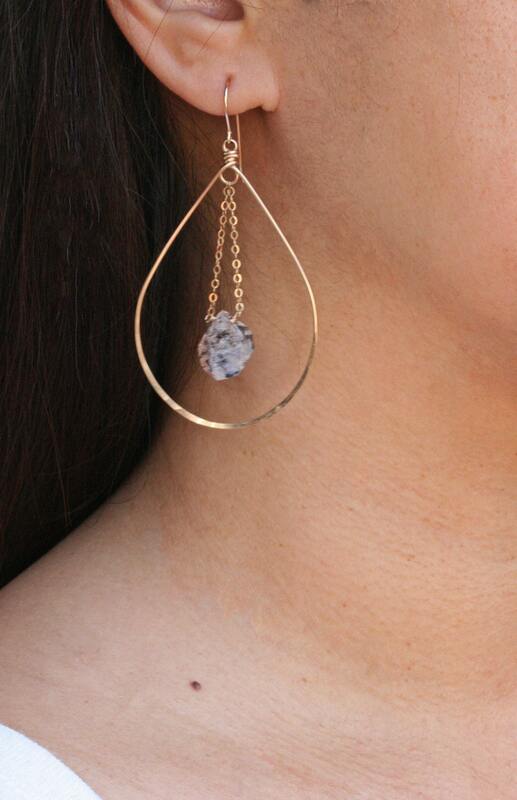 The hoops are handcrafted, shaped and hammered at the bottom for texture and shine. 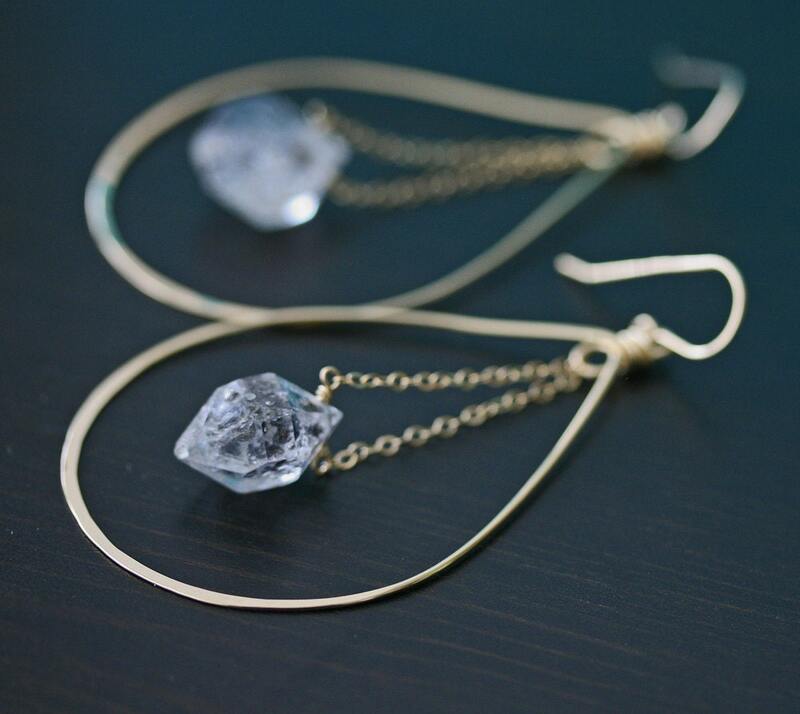 Herkimer diamond centers are approximately 12 -16 mm in length. Jewelry is shipped in either a white shipping box or padded envelope for smaller items. All jewelry (except large beaded bracelets) are shipped in an anti- tarnish plastic bag which is placed inside a satin grey bag with Laura Hunter Handmade Jewelry stamped outside. Perfect for keeping your jewelry nice or for gift giving. If your item is a gift and you would like me to add a note to the recipient, please contact me directly through Etsy's messaging feature. All geode and druzy/drusy is unique and one of a kind. I do my best to pair geodes and druzy for earrings based on color or size. With that being said, when you order a pair of earrings the druzy will NOT be identical. This is what I find interesting and beautiful about these earrings. Feel free to contact me if there is something specific you have in mind. I am happy to try to accommodate requests. Some geodes are color enhanced. These are real sliced stones not plastic or glass. They are beautiful and delicate. They hold up well in jewelry when treated with care. If you drop your earrings or necklace on hard surfaces like travertine or granite, to name a few, it will cause damage or breakage. This is not a craftsmanship issue. I provide backs to earrings to keep them from slipping out. Necklaces have a secure S clasp and stay fastened around the neck. Please treat your geodes with care and you will have jewelry that lasts for years and years. Most photos are samples only. You will NOT receive the exact piece pictured UNLESS it is stated in the listing that it is one of a kind. I photograph most jewelry using a macro lens to show detail. Please refer to the sizing in the listing for accurate size. If you have any questions or special requests I will be happy to try to accommodate them. Please use Etsy's contact feature for inquiries. This is a handmade micro-business. It's just me making each piece of jewelry with care. My processing time to make the jewelry is 3 - 7 business days unless otherwise noted on the listing. I generally offer either USPS First Class Mail or Priority Mail. When I generate your shipping label, Etsy will send you a tracking code. I can not guarantee USPS' shipping times. Please contact me directly about UPS, FedEx or other upgraded shipping. ON A DEADLINE? Need it for a birthday or before a certain date? Let me know and I will work with you on accommodating your need. All Etsy's Return/ Exchange Policies Apply. EU has 14 days to contact me for return/exchange. Build your own Druzy necklaces are custom items: You can choose your geode slice/ druzy on my blog. You will find this information in the listing. 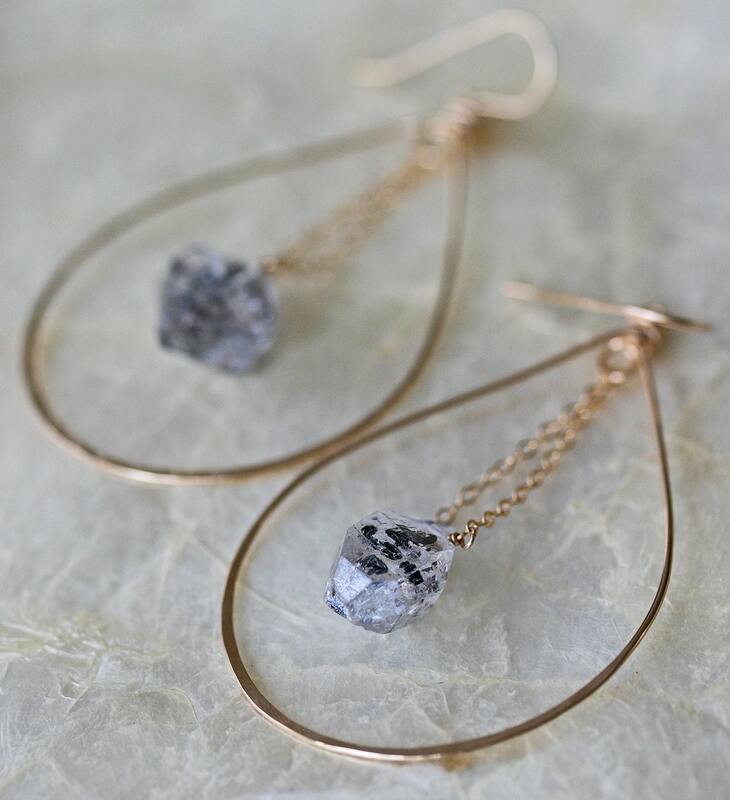 If I don't hear from you about which druzy you would like, I will choose for you. Custom Items are not returnable. Chains: I can not return/exchange a chain on a necklace. You can purchase a new chain for your necklace. Please contact me for details.